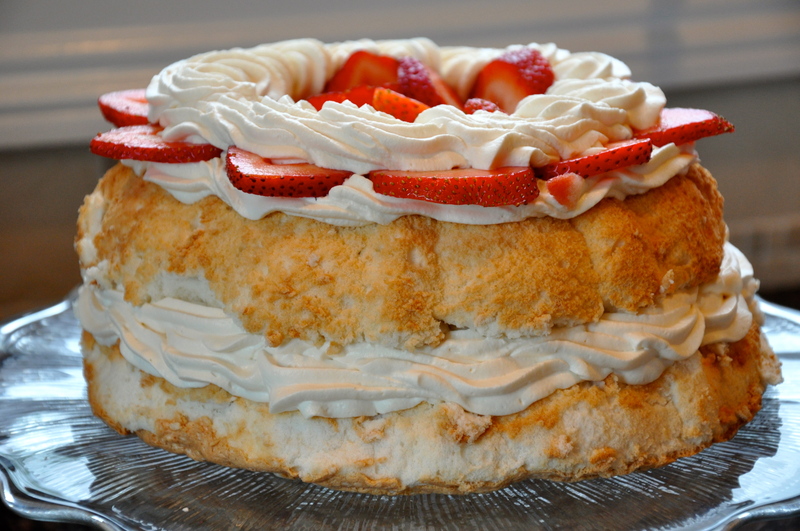 So when I say ‘Angel Food Cake‘ the flavor that my taste buds conquer up is typically, well let’s call a spade a spade and say, underwhelming. Usually its that light, bland, but slightly sweet, with a strawberry kick. 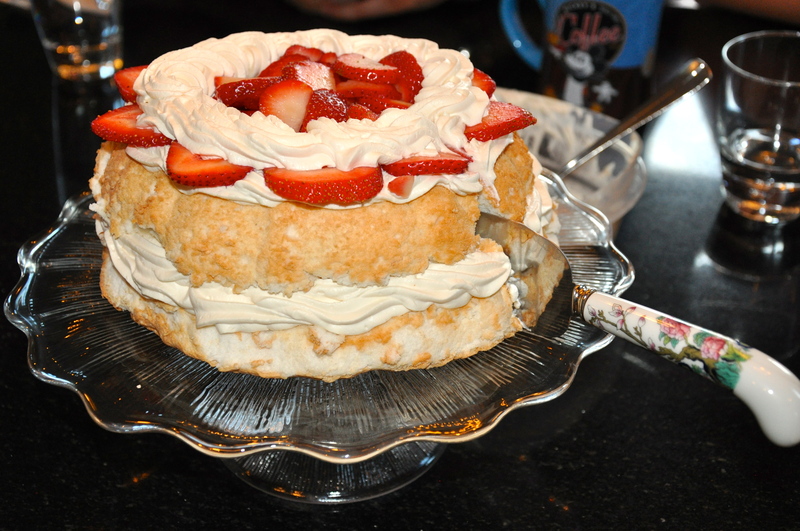 In that case, this was the crazy ‘roided-out, and zealous cousin of the angel food cake. It was light and fluffy but JAMMED with flavor without crossing into the too sweet territory. A miraculously still intact bundt! You’ve heard of this? Apparently we’re supposed to flip the angel food cake upside down to let it cool on a funnel or bottle of wine (which do I typically have sitting in my kitchen?) I’m kicking myself for not taking any photos of the hilarity that ensued but I was too concerned about the actual cake. Basically within minutes of flipping the cake upside down, I had an angel food tire around my empty bottle of red. It managed to not break but wasn’t as fluffy as I thought it would be. 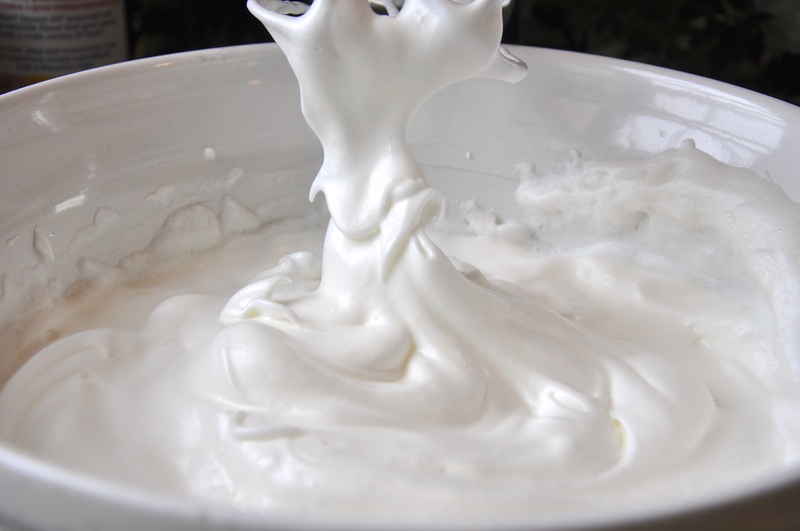 The secret to an amazing whipped cream is about a Tablespoon of sugar and Vanilla! Sometimes, I switch it up and add almond extract. 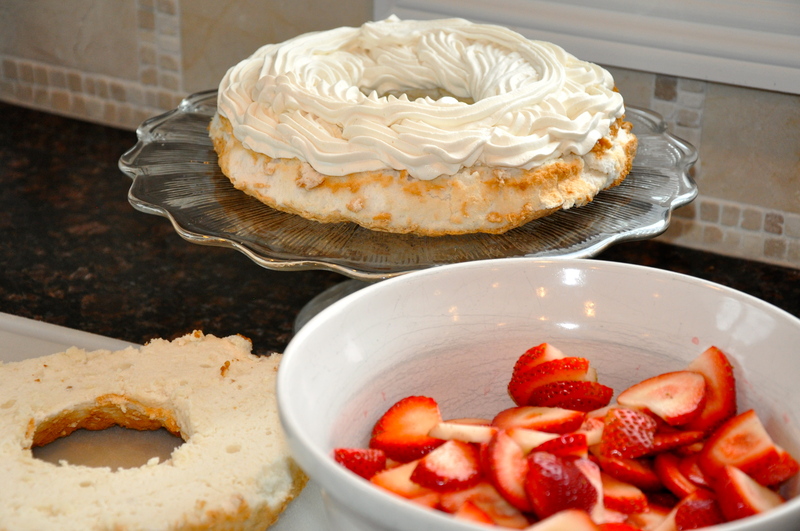 The idea is to allow the whipped cream to have a real presence at the table without overpowering the strawberries. Jersey Fresh Strawberries? Nothing like sweet summertime fruit! My dad’s birthday is week before fathers day. So that means it’s typically a joint celebration and one cake sort of deal. This year (because of conflicting schedules and the fact we couldn’t all get together at once) we had TWO celebrations! Checkerboard Cake was the birthday cake and this delight was for Father’s Day! 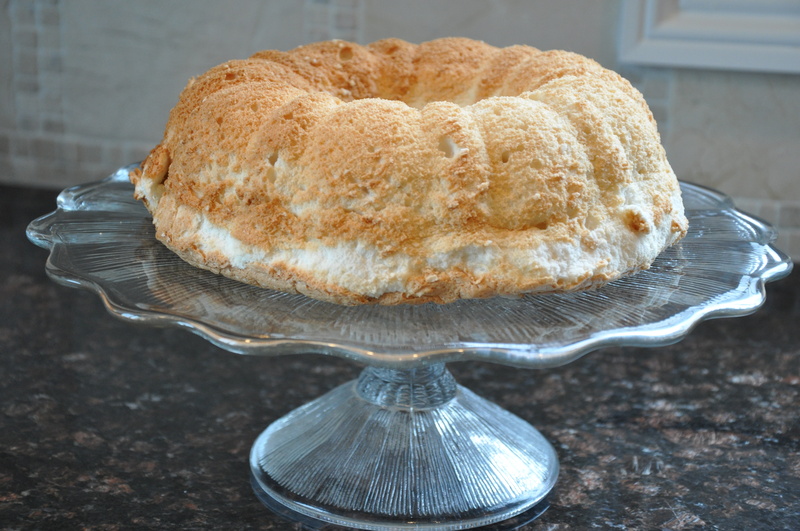 For some reason my dad LOVES angel food cake (I love you Dad!) 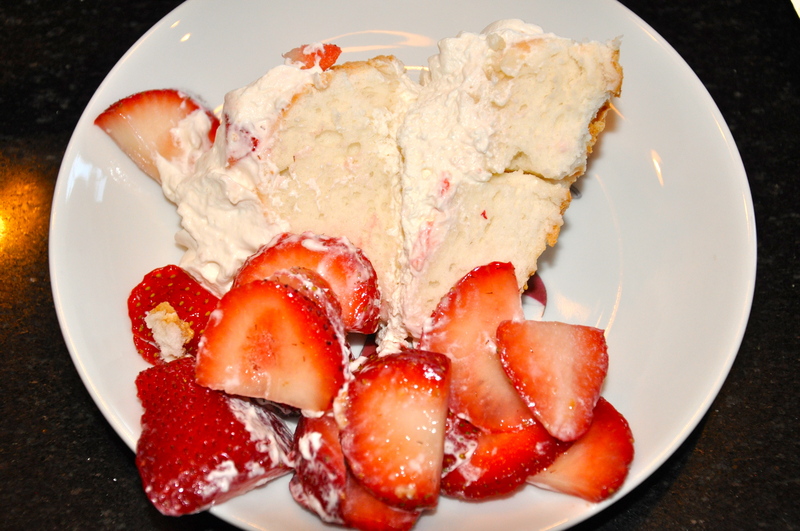 but after this recipe – I promise from here on out, I’ll be happy to make this again! 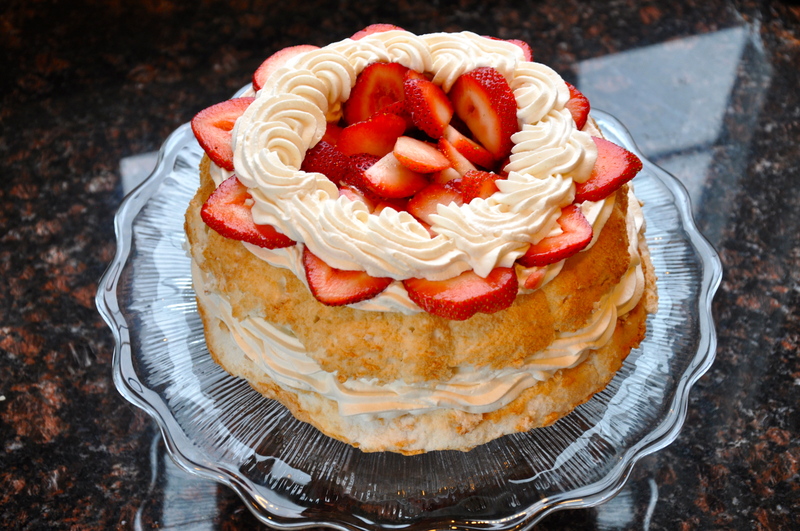 Make sure there’s extra strawberries ready to serve – this will NEVER be enough! If you think you’re drooling over the photos – give the recipe a try! The best is yet to come! A bit messy, but incredible! I usually eat a serving of the cake/cupcake/dessert I make and let the leftovers go to the families/friends/moochers. (Moochers? Only kidding! – slightly) But this time, I had leftovers 3 consecutive days in a row! It’s really THAT fantastic! Stay tuned for the recipe after the jump! Before it get’s all messy as these cakes tend to do. Before you being: Realize even though you’re an avid baker, you don’t keep cake flour on hand; so visit this page. 1. Important to Note: DON’T get any yoke in the whites! I typically use 3 bowls and separate the egg in a the empty first. Then if no yoke, pour into the egg white bowl. 2. DO NOT GREASE PAN. 3.. Heat oven to 375°. 4. Sift the cake flour and 3/4 cup + 2 Tbsp sugar; set aside. 5. Combine the extracts in a small bowl; set aside. 6. Beat egg whites, cream of tartar and salt until it forms peaks. 7. Add the other 3/4 cup of sugar slowly, then beat on high until stiff peaks form. 8. Beating on LOW, add flour mixture and extracts slowly (now would be a great time to attach the guard for mixer). Make sure you fold in the sides and bottom of your mixing bowl. 9. 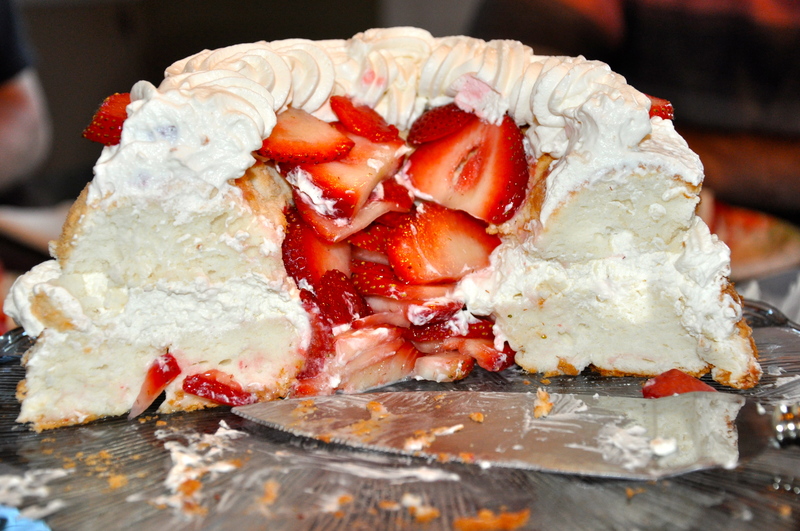 Spoon into an angel food cake pan. 10. Slide a knife through batter to remove air pockets. 11. Bake 30-35 minutes or until top springs back when touched lightly with finger. 13. To remove the cake from your pan run a knife around the rim of the cake pan just to get the ‘crust’ away from the pan. Then firmly spank the sides of your pan and invert onto your serve plate. **I tried the ‘invert the cake pan on a wine bottle’ trick – complete fail. The cake actually slipped down and circled the wine bottle. It was actually remotely amusing after I realized the cake didn’t tear or break (somehow!). So try that one at your own risk. Happy Baking! Any fun 4th of July Baking Plans? Yes please! I’ll take TWO! Wow. Just wow. This looks amazing. I have to make this!